The Montreal sky was illuminated that Sunday night by northern lights — a harbinger, the newspapers would later say, of the good news to come. In the morning, around 6 a.m., every bell, whistle and siren in the city began to sound. 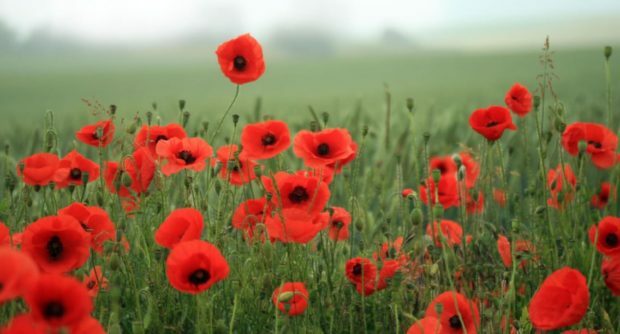 This is no ordinary Remembrance Day in the Commonwealth and much of Europe, and Veterans Day in the United States. 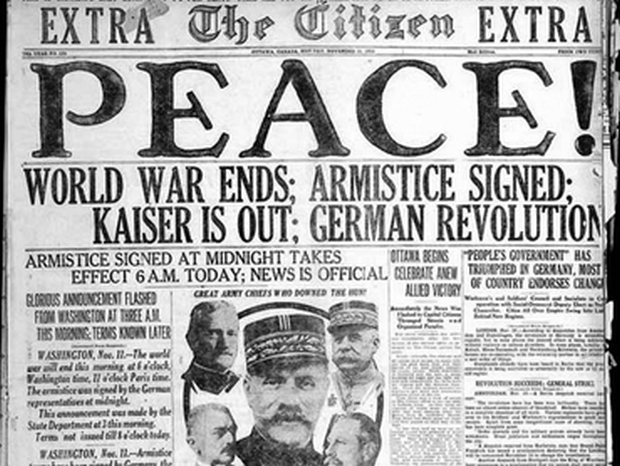 Today we mark the one hundredth anniversary of the Armistice that brought to an end the most terrible war in history. Exactly a century ago – on the eleventh hour of the eleventh day of the eleventh month – the guns fell silent on Europe’s battlefields. The belligerents had agreed the terms of the peace at 5am that November morning, and the news was relayed to the commanders in the field shortly thereafter that hostilities would cease at eleven o’clock. And then they all went back to firing at each other for a final six hours. On that last day, British imperial forces lost some 2,400 men, the French 1,170, the Germans 4,120, the Americans about 3,000. 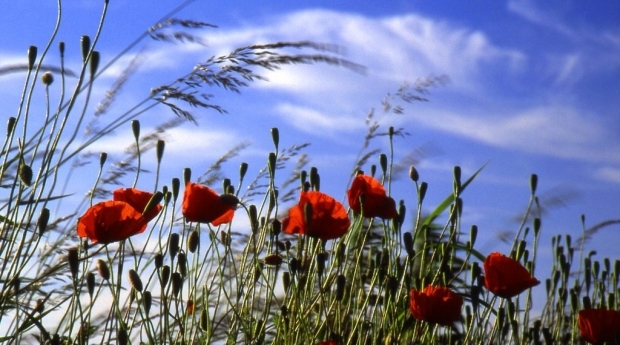 The dead in those last hours of the Great War outnumbered the toll of D Day twenty-six years later, the difference being that those who died in 1944 were fighting to win a war whose outcome they did not know. 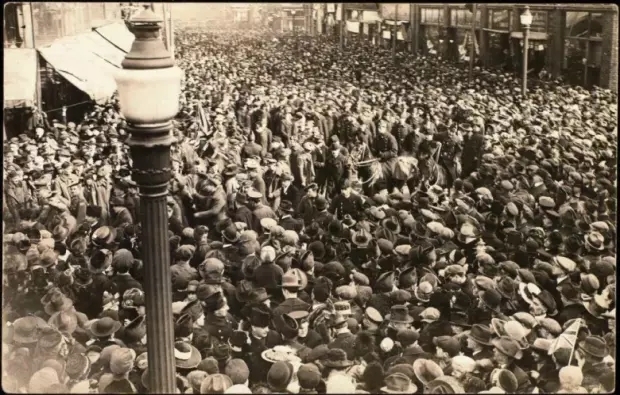 On November 11th 1918 over eleven thousand men fell in a conflict whose victors and vanquished had already been settled and agreed. In the days leading up to the Armistice that ended the Great War, Lance Cpl.Frank Teskey was almost killed twice by the relentless shelling of the retreating Germans. You’d have never known it from the letter he wrote (in pencil) to his mother on Nov. 11, 1918. He made no mention of the close calls. It’s not the kind of stuff soldiers tell their families — even today. 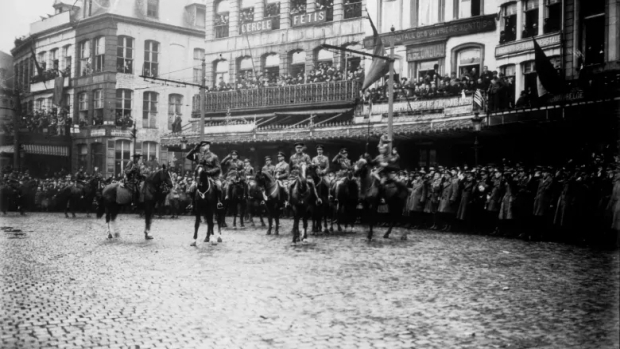 Instead, he focused on the Canadian Army’s advance into Belgium and the outburst of joy among the people of Mons that followed the arrival of the 11 a.m. armistice. One should not visit the sins of the father upon the son, but Prime Minister Justin Trudeau is now off to Vietnam, flying there in the slipstream of U.S. President Donald Trump’s own trip. 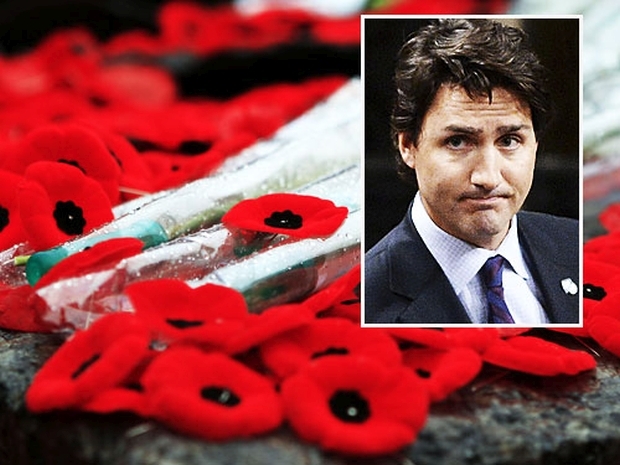 This means Trudeau will not be at the War Memorial in Ottawa on Saturday, or placing a wreath at the Tomb of the Unknown Soldier, when our world stops for a few brief moments on Remembrance Day to honour the sacrifices made by past and present generations to ensure the freedoms we enjoy today. This troubles me to no end. A small Ontario town is doing more to mark the 100th anniversary of the end of the First World War than the entire federal government. 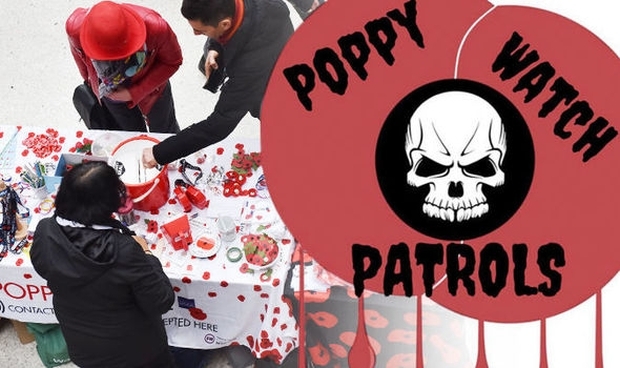 “In the coming days and weeks, Irish Socialist Republicans and Anti-Imperialists in Dublin, will be organising ‘Poppy Watch Patrols’ to prevent the sale of the British Legion Poppy on the streets of our capital city. 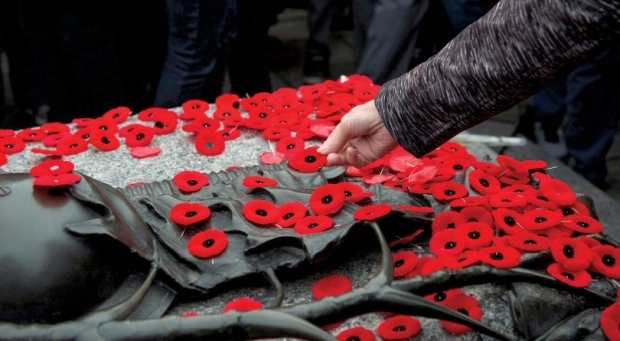 November has arrived, and the Ontario government released a video for the month of remembrance. 30 seconds long, the video captures intense moments of war, showing footage of the Canadian military from the First World War until the present. The video’s music is fierce and bold as opposed to the traditional melancholic tunes associated with Remembrance Day footage. “I just wear my peace button on my jacket as always and wait for the collective brainwashing to blow over,” said Laura Kaminker in a 2014 blog post. 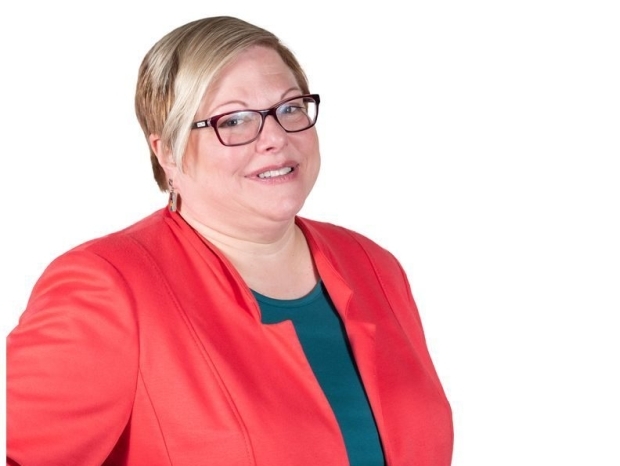 And now, Toronto Sun Journalist Joe Warmington has uncovered comments made by Laura Kaminker – the Ontario NDP candidate for Mississauga Centre. Kaminker is originally from the United States. 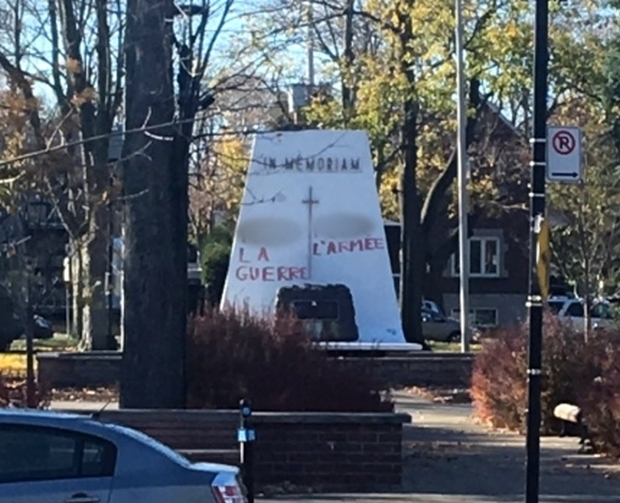 Just as Remembrance Day ceremonies got underway Saturday morning, a war memorial was defaced in the Montreal borough of Saint-Laurent. Berj Merdjani saw the red graffiti, that said “F–k war” and “F–k the army” in French, as he was entering his photography studio across the street from Beaudet Park. 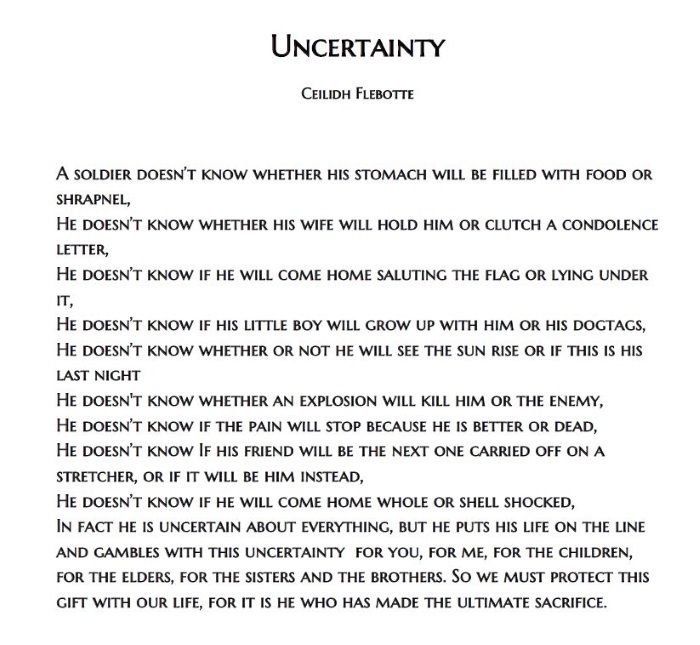 A poem of remembrance by the young daughter of one of our readers. A heartfelt thanks to all who served. Reader RM’s Dad on his return from overseas – Same Regiment as My Dad. There are always classes of schoolchildren at the cenotaph. I can’t help but wonder what they’re thinking, and how much they really know about the wars being remembered. As the son of a veteran, growing up with Rat Patrol and Hogan’s Heroes in after school syndication, I’m part of a generation that still felt the shadow of World War Two amplified by the geopolitical hangover of the Cold War. Perhaps these kids are luckier than we were; I don’t get the feeling that 9/11 casts the same shadow over their lives. I hope my anxiety about what sometimes seems like either indifference or amnesia is unfounded, but I have a bad feeling about it all.